Are you the Ace in the sky? 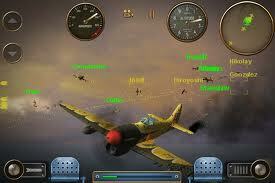 This WW2 flying game is great and uses the accelerometer. First you pick a plane – German, American or British. Then pick the main weapon – rockets, bombs or heavy machine gun (you also have a light machine gun). On your own you can have set dogfights, which as you go through them vary by the number of enemies and the number of your wingmen. There is also a campaign which changes from you attacking ports to escorting bombers. There is an online multiplayer which you can either have a huge ‘dogfight’ (teams and free-for-all) or attack the base. This is a fantastic game, you will not stop playing on it.